Clothing can make all the difference in a fun and safe winter outdoor experience. Whether you’re going for a walk, running, skiing, or snowshoeing, dressing for the cold is essential to maintain your exercise regime throughout the winter. The best way to dress for cold weather workouts is to incorporate layers. When it comes to layering, remember the acronym BITE: Base, Insulation, Top Layer and Extremities. Start with a base layer — this is the layer that goes against your skin. You want a material that will “wick” sweat away from the body. Examples are wool, polyester, and polypropylene. Cotton is one of the worst fabrics to use for a base layer because it will stay wet and you’ll get cold. Staying dry is essential to comfort and warmth during winter fitness. Next is the insulation layer. This is the layer that keeps out cold and keeps in warmth. Fleece is the perfect insulation layer. You’ll want to base your insulation layer choice on the type of activity you are doing. If you are walking, you’ll want a warm insulation layer, if you’re skiing you’ll want something lighter. A lightweight down jacket can work well for many activities. Follow the insulation layer with your top layer. The top layer is to provide protection from moisture like rain or snow. 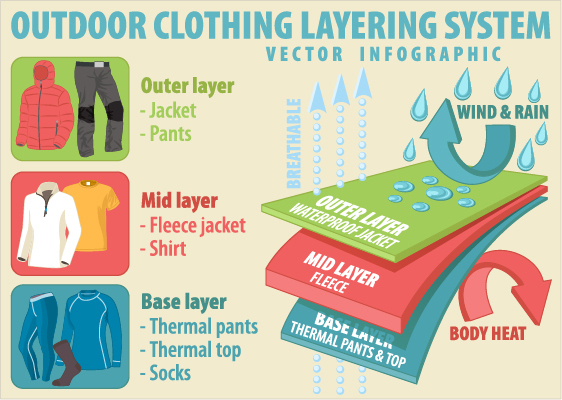 Jackets, pullovers, and shells are considered top layers. Water resistant or water proof but breathable fabric is an excellent choice. These fabrics can be expensive, but they are worth it in the long run. Fabrics such as polyester blends help trap heat and prevent evaporation. These fabrics keep you warm and dry. Finally, don’t forget your extremities. Exercising pulls blood away from your extremities and toward your core, so it is important to properly cover your head, hands and feet. Wear hats and mittens or gloves to help with this. Technical fabrics will be your friend in this category as well. Look for performance gear that will keep you warm but breathe so you don’t sweat. For your feet, look for socks made from a wool blend are thin but can keep toes dry and toasty even in the coldest weather. Make sure your boots are not too tight – they need a little air to retain warmth. Winter is here, so find a winter activity you enjoy, and start living a healthier life. But don’t forget to dress for it!